At the start of December my wife and I ﬂew with two friends to Goa. Not for a relaxing beach holiday, like most folk who visit Goa, but to visit a dear brother who is pastoring a young Pentecostal church. He had asked if we could help with some solid Bible teaching. We had an amazing time and around 30 young people attended for four days of teaching. We did a quick overview of the story of salvation, showing Christ in all the Scriptures as well as teaching on the theology of salvation. Many of the young people, who were very hungry for God’s Word, are now regularly listening to sermons on the web. Whilst there my wife spoke at a Christmas ladies outreach in a mission church started by a nurse from Dharwad who, in her retirement, still wanted the gospel to be proclaimed. There were around 40 ladies attending, who heard the good news of Christ’s birth in song and skits as well as the talk. Many of the families who attend the church are from very poor backgrounds. So each night we visited the slums where they live. With a little trepidation we went along on the ﬁrst evening. However, we were given a very warm welcome in the ﬁrst house, with typical Indian hospitality. As the family had many children I told a Jungle Doctor story to preach the gospel. My wife prayed with the ladies. As we walked to the next believer’s house, news spread quickly and children started following us so they could hear the crazy foreigner tell his stories. Each time we walked through the slums more and more children followed, we felt like the Pied Piper of Hamelin! 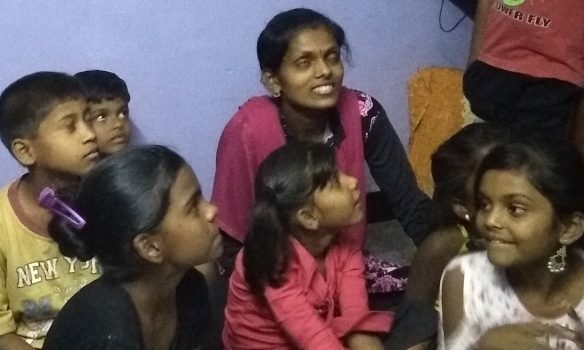 Please pray for our pastor friend, for the mission church, the on-going discipleship of the young people and the believers and children we met in the slum areas.